Delivering one baby is wonderful. 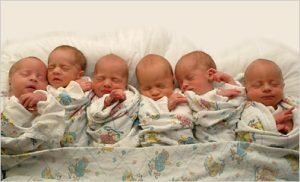 Giving birth to twins, triplets, quadruplets, or other multiples is all the more wonderful. But pregnancy, labor, and delivery are intricate processes. The more babies involved at once, the greater the chances that complications could arise. Prematurity. Nearly 60 percent of twin births, and close to 90 percent of greater multiples births are premature. A baby is premature when born before 37 weeks of gestation. Premature births can result in life-long complications such as vision loss, hearing loss, cerebral palsy, and mental retardation. Intrauterine Growth Restriction. IUGR is diagnosed when an ultrasound test suggests the fetal weight is below the 10th percentile for the gestational age. This can mean that a baby’s internal organs are reduced in size. Asymmetric IUGR is when the baby’s head and brain are of normal size but the abdomen is smaller. IUGR typically results from lack of oxygen, blood flow, and nutrients – a common risk among multiples. IUGR may increase the risks of hypoxia, the need for a C-section, the development of neurological disabilities, hypoglycemia, meconium aspiration (when the baby swallows their first bowel movement), and other life-threatening complications. Anemia. Women carrying more than one baby are at a higher risk for developing anemia. Anemia is a lack in healthy red blood cells that results in an inadequate amount of oxygen flowing throughout the body. Anemia can increase the risk of premature delivery and low birth weight. Gestational Diabetes. A condition in which there is too much sugar in the mother’s blood supply, gestational diabetes can increase the risk of preeclampsia (high blood pressure accompanied by malfunctioning organ systems), having a baby over 9 lbs., and premature birth or stillbirth. Gestational Hypertension. Also known as pregnancy-induced hypertension (PIH), gestational hypertension is high blood pressure during pregnancy. Gestational hypertension can increase the risk of low birth weight (due to the placenta not receiving enough blood) and preeclampsia. Placental Abruption. When the placenta detaches from the uterine wall before delivery, the babies can be deprived of oxygen-rich blood and nutrients. Placental abruption can also lead to heavy bleeding for the mother. Death. Though uncommon, a miscarriage (death before 20 weeks), fetal demise (death after 20 weeks gestation), and stillbirth are more likely to happen with multiples than with single pregnancies. Vanishing twin syndrome, when one baby dies in the womb and the other survives, is a specific example of loss of life among multiples. Because of the heightened risks with pregnancies involving twins and multiples, it is critical that your doctor is vigilant throughout your pregnancy. It is the medical professionals’ responsibility to do everything possible to be aware of the risks, to detect problems, and to keep both you and your unborn baby safe. If a doctor neglects to treat a condition, or fails to identify the problem in the first place, the results to mother and baby can be catastrophic. If you or someone you know has suffered because of a doctor’s mistake or negligence, you should not have to go through more pain and frustration than you already have. Contact Thurswell Law today, and we will help you receive justice. We have been working on birth injury cases since 1968, and our consultations are free. Call us toll-free today at (866) 354-5544.